Matlock Town Reserves in action. A hat-trick by new signing Moussa Diouf helped Matlock Town Reserves come from behind and survive a missed penalty to beat Keyworth United 3-2 at Causeway Lane. Diouf’s goals, which followed a double on his debut the previous week, extended the young Gladiators’ unbeaten run in the Central Midlands League’s South Division to six matches and lifted them to sixth in the table. 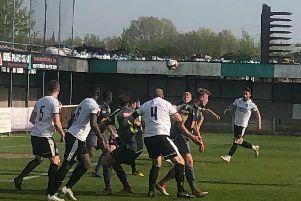 Town started brightly and created the first chance when Eddie Finney found himself with an open goal after a deflection. But his tame strike was cleared off the line, and a few minutes later, Matt Antcliffe gave the visitors the lead instead, slotting the ball home neatly. Just before the break, Keyworth doubled their advantage when Beau Brady picked out Adam Taylor, who steered the ball past ‘keeper Jordan Pierrepont. Matlock came into their own in the second half, and the impressive Diouf superbly arched the ball beyond the despairing Keyworth stopper, Darren Standage, to give them belief. Minutes later came the spot-kick miss when Billy Whitehead’s effort was saved after he had been fouled. And as Town continued to apply pressure, they wasted another golden chance when Marcus Beddoe’s shot hit a post and the ball bounced out to Diouf, who couldn’t convert. However, all the home side’s pressure finally told when Diouf redeemed himself, towering above defenders and powering his header beyond Standage. The comeback was complete in the dying seconds when Beddoe’s cutback was turned in by Diouf for the winner.